The world’s best performing stock market for 2018, the Jamaica Stock Exchange (JSE), marked its 50th Anniversary of operations on Sunday, February 3, 2019, with a thanksgiving service at the historic East Queen Street Baptist Church in Kingston. The service marked the beginning of the JSE’s twelve months of celebration and market education activities. On Thursday, February 7, 2019, the JSE held its first event dubbed, “Market Meets the Market by the Sea“. This unique concept seeked to bridge the gap between the Farmers’ Market and the Stock Market and its services. The Minister of Industry, Commerce, Agriculture and Fisheries, the Hon. Audley Shaw, was the keynote speaker. Minister Shaw in his address expressed how pleased he was with the innovative concept by the JSE. He informed the large crowd that his Ministry will be focusing on four key groups to promote and increase local agriculture: schools, hotels, CARICOM and the Jamaican diaspora. He noted that hotels needed to be more supportive of local farmers and that children in schools should eat more of what is grown locally. He highlighted CARICOM and the diaspora, because of the demands overseas for locally produced goods. In closing, he thanked the JSE for their continued innovation and financial inclusion for all Jamaicans. As a key sponsor of the event, Miss Antoinette McKain, CEO, Jamaica Deposit Insurance Corporation (JDIC), commended the JSE on its journey. She also applauded the JSE for its creativity in conceptualizing and hosting an event of this kind, as timely and inclusive. Mr. Steven Gooden, CEO, NCB Capital Markets Limited and President of the Jamaica Securities Dealers Association (JSDA), spoke about the impact of the Junior Market on the growth of the Capital Markets. 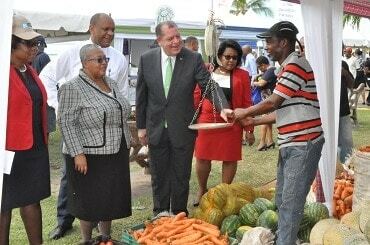 He asked Minister Shaw, whose influence kept the Junior Market incentives alive, to do so again by encouraging the establishment of the Micro Market so that the agricultural and other similar sectors can benefit from accessing financing to grow. Mrs. Grace Burnett, CEO, GraceKennedy Financial Group Limited (GKFG), also congratulated the JSE and sponsors for this novel concept. She also stated that this kind of collaboration was very good for the development of Jamaica. She noted that the GraceKennedy Group will work with organizations that are doing good for Jamaica and to help underserved communities. The Chairman of the JSE, Mr. Ian McNaughton, in his brief remarks, applauded the management and staff for continuing to reinvent, innovate and add to shareholders’ value, through creativity and foresight. Mrs. Marlene Street Forrest, Managing Director of the JSE, in delivering her welcome, expressed delight with the support of the twenty (20) farmers who represented seven (7) of the fourteen (14) parishes across the island as well as the patrons who gathered from as early as 6:00 a.m. Mrs. Street Forrest noted that the main focus for the 50th Anniversary is financial inclusion. “This concept of Market Meets the Market is a perfect start. Just imagine, [the] Stock Exchange and Agriculture joining together as two powerful engines of growth,” she remarked. Mrs. Street Forrest thanked the companies that answered the call to partner with the Exchange and the patrons who responded to make the event a success. Approximately 2,000 patrons attended throughout the day.